Hello there crafty friends. 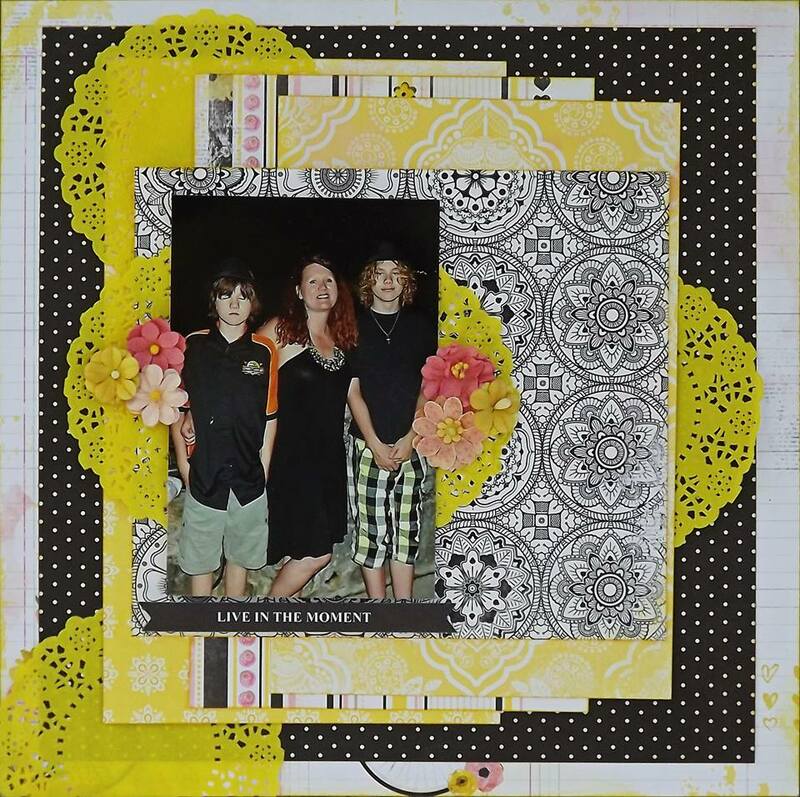 Here you will find my layout I created using the Scraps of Darkness April Blue Skies & Sunshine Kit. As soon as I saw the colors, I was like this will be perfect for my brother's upcoming nuptials. They had such a beautiful wedding. It was outdoors and just a perfect day. I've waited patiently for the pictures to come in. Her colors were grey, white and yellow!! You can bet I will be doing several projects with these fabulous photos from such a spectacular wedding filled with love. My brother Robert and his new bride Samantha, his high school sweetheart. Now lets take a closer look. 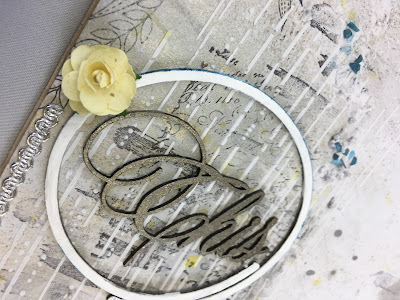 Here I used the the circle chipboard from Blue Fern Studios. 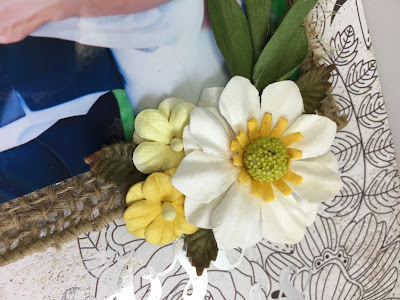 The flower was also included in the kit. I painted the chipboard white. 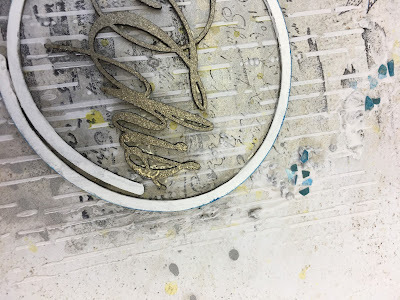 The other chipboard was from my stash and I heat embossed it in gunmetal grey. Next up is a section of the layout where I used more chipboard from my stash that I painted with white gesso. 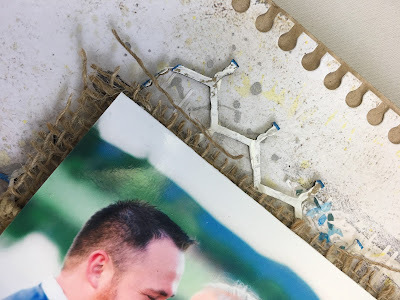 I edged the chipboard with the blue ink that came in the kit. I layered the picture on top of some burlap looking ribbon. Underneath the chipboard you can see more splatters and some of the blue Ice Resin sparkles. Next up is another chippie from my stash that I heat embossed with gunmetal grey. I also placed some beads with modeling paste. I also once again put some blue Ice Resin sparkles. I just loved sprinkling those all over the page. I also made a small tear at the bottom of the page and tucked in a little lace. 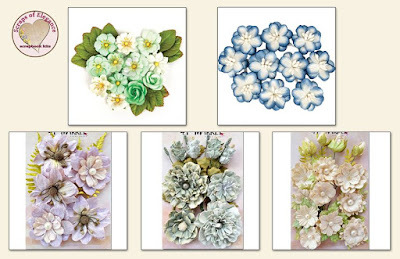 Next up is the flowers that were included in the kit. I wanted to tuck them in the corner to bring out the white and green as seen in the photo. Make sure to check out the store because we DO have some of the add on's still available. 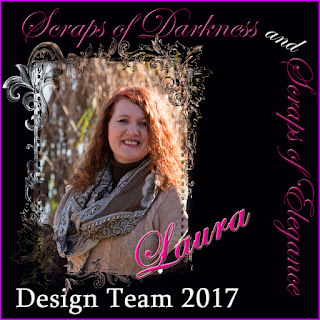 Check out all the available goodies here: Scraps of Darkness. Also check us out on Facebook and join in our challenges and swaps. A few years ago we went to Niagara Falls and my hubby took this photo of our boys and me. Unfortunately Ty had his eyes closed. I still scrapbooked the photo because it was an important memory and I wanted to document it. 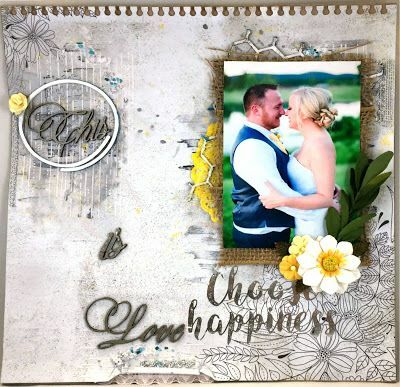 I used the awesome Scraps of Darkness April 'Blue Skies & Sunshine' kit, which fit perfectly for this layout . 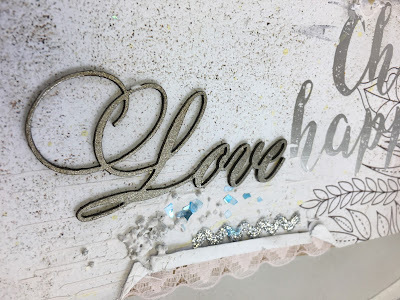 I did some layering of the Bo Bunny Petal Lane papers and added doilies from the main kit. 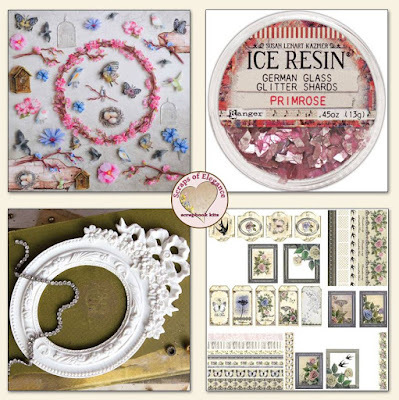 Nicole here, back with some more Scraps of Elegance April 'A Song of Spring' kit inspiration! I am absolutely loving the colour scheme of this page. It is so perfect for Spring with its soft pastel lilac and mint green. a combination of blooms from Prima and 49 and Market. for my layout. Look at how it matches with the colors in the girls' adorable dresses! As soon as I saw this design on the 49 and Market paper, I knew I had to use it somehow! the ripped green background paper as if they are far away in the distance. The grey layered birds add even more depth to the entire scene. I am so blessed that my friends let me scrap their daughters' pictures. Look at these adorable little girls! 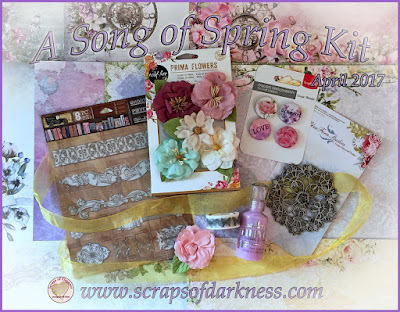 Let's take another look at the Scraps of Elegance kit and add-ons I have played with this month. 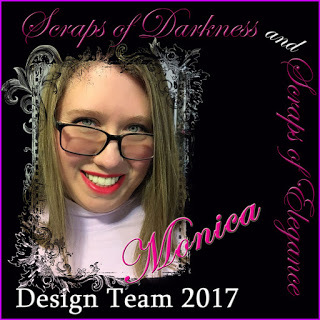 Click HERE to learn more about Scraps of Darkness and Scraps of Elegance kits! 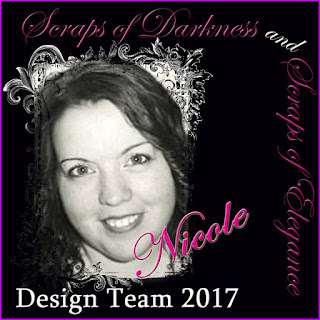 Be sure to share your creations with us on the SOD & SOE Facebook Community Page. Monica: Gorgeous page! I love the soft colors, perfect to highlight the sweet photo! Laura: Awesome page! Love the flower cluster on both sides of the photo! Nicole: Lovely page! I love the paper tearing, and the tag sticking out from behind the photo!